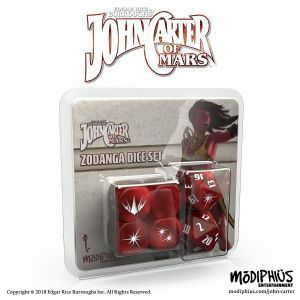 Modiphius Entertainment presents the John Carter of Mars Zodanga dice set. Show your loyalty to the red city of Zodanga with these high quality, custom dice. 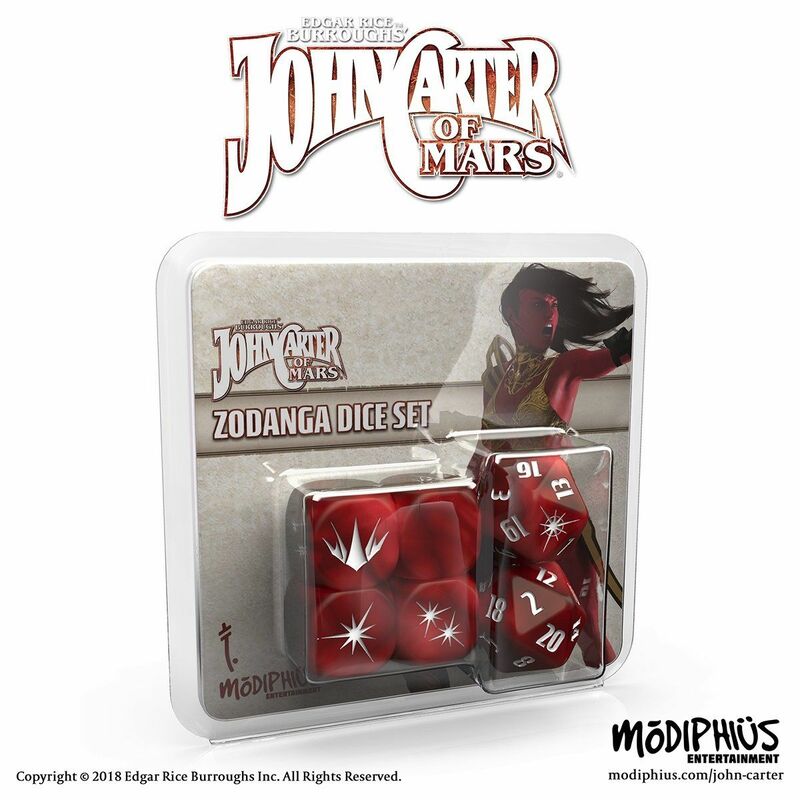 • Two d20’s and four d6’s in beautiful two tone red color, featuring custom symbols specific to the John Carter of Mars roleplaying game. PLEASE NOTE! These dice are not required for play. The core rulebook contains a guide showing how to use normal dice. Edgar Rice Burrough’s John Carter of Mars: Adventures on the Dying World of Barsoom transports you to the Red Planet of Barsoom, an arid, dying land of ancient civilizations and fearsome creatures. A Collector's Slipcase for the John Carter of Mars Roleplaying Game including the core rules and the Phantoms of Mars campaign book. 4-panel narrator screen and a 36-page booklet. A 128 page, full colour, landscape hardback book with a complete campaign arc for the John Carter of Mars roleplaying game. Two d20’s and four d6’s in a bright Thark green color, featuring custom symbols specific to the John Carter of Mars roleplaying game.